First of all - Its a series - I knew that going in but it still sucked on the last page. Second, and most importantly. I LOVED THIS BOOK. I seriously fan girl loved this book. Third - this was a first for two things. It was my first Kindle purchase (Technically the Stand was...but that hardly counts since I was just trying to get it in all formats) and it was also my first experience with a self published author. 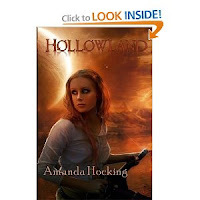 Amanda Hocking actually published this book through Amazon (and Barns and Nobel). She is amazing. I can't wait for Hallowmen due out in September and you better believe I am there when it uploads! I have already download another of her books, My Blood Approves. Okay that all being said let me get to this book. This takes place a year after virus turns most of the population into rage induced Zombies. Not in the walking dead verity, more like rabies with a twist. (which is why I kind of liked it, made it more believable). Remy is out searching for her little brother, whom she was separated with when their compound was overtaken by zombies. Her and another girl, Harlow and they meet up with Blue and Lazlo and head to another safe compound, in hopes her brother is there and more importantly, alive. This was an amazing book, with a strong female lead, which I loved. The characters are amazing, the story telling is fantastic and I am just so looking forward to devouring everything else Amanda has written. I strongly recommend this book even if you don't go for Zombie fiction.